If you’re a theatergoer who truly subscribes to the philosophy of “if it’s not on the page, it’s not on the stage” or “the play’s the thing,” you’re probably better off avoiding Norma Jeane Baker of Troy, the initial offering at the just-opened The Shed, the gorgeously-designed state-of-the-art performing arts center at Hudson Yards. But this decidedly unconventional work is not without its rewards and compensations. This occasionally hypnotic, distinctly unconventional and primarily less-than-comprehensible “melologue” (aka a monologue with music), created by the Pulitzer Prize-winning poet Anne Carson, attempts to merge the stories of Marilyn Monroe and Helen of Troy, two of the world’s most beautiful women. 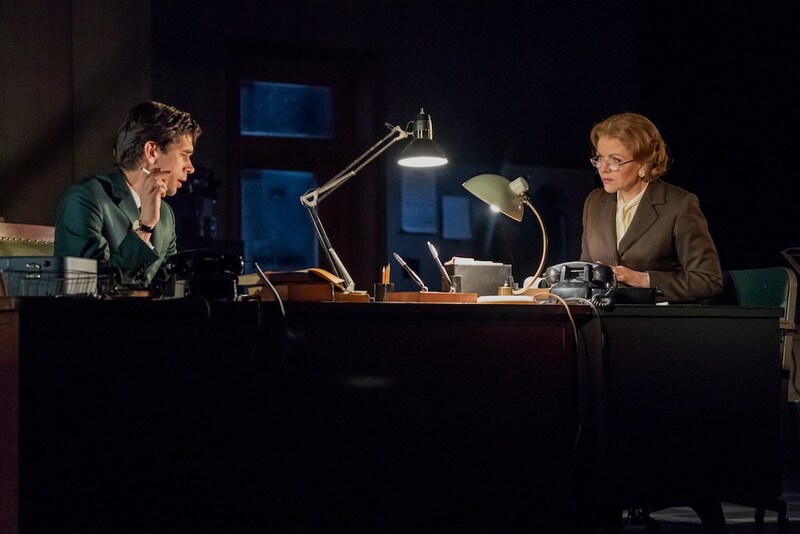 The entire work is delivered essentially as a play that is being written by an unnamed fellow (Ben Whishaw) in an almost-deserted typing pool office on New Year’s Eve in 1963 (the too-enormous, stunningly detailed set is by Alex Eales) and being taken down by a mysterious secretary-like figure (embodied by a thoroughly deglamorized Renee Fleming). 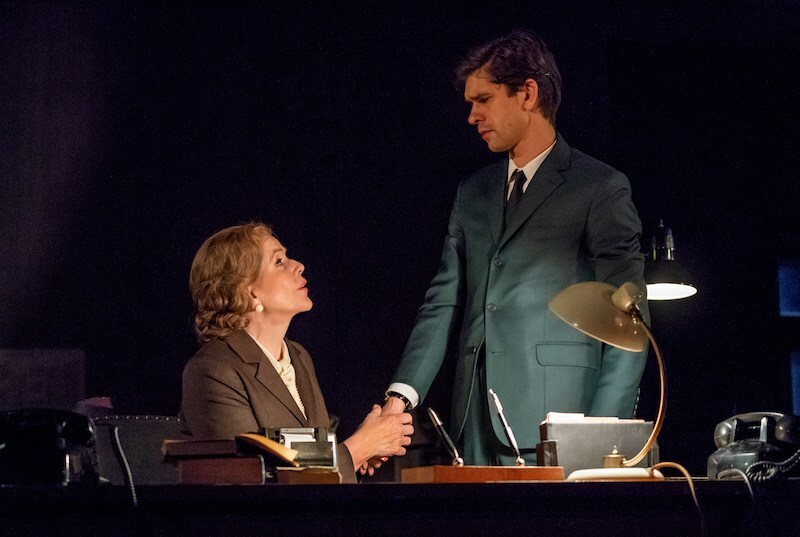 Indeed, Whishaw’s character often dictates actual stage directions (not very exciting) and taped recordings are substituted for spoken dialogue, with some sections of the work being repeated more than once. But unless you are thoroughly familiar with both women’s histories—and this view of Helen comes from the lesser-known play by Euripides—most of the text ranges from the abstruse to the downright confusing. Did Monroe actually have a daughter named Hermione? Was Helen really married to someone named Arthur, King of Sparta and New York? Why was Monroe consorting with both Truman Capote and Pearl Bailey? Was the Trojan War actually fought over a cloud? The answers are not forthcoming, nor is it particularly clear what Carson truly wants to say by connecting these tales, beyond the fact that both women were essentially used and abused by male-dominated societies. Sadly, the British director Katie Mitchell is less interested in illuminating the text (or the stage to be honest) than creating stage pictures or setting mood. Still, I did mention compensations, right? Whishaw, in one of his rare New York stage outings, shows off an incredible commitment to the work, not just in his delivery of the lines—sometimes attempting to sound like Monroe—but most of all in his character’s methodical, unsettling transformation from suited fellow to the spitting image of Monroe in her iconic outfit from the film The Seven Year Itch. And Fleming, while often silent, not only shows great skill as an acting partner; she periodically unleashes her gorgeous voice on Paul Clark’s bluesy songs that comment on the action, and I could easily listen to her haunting song about Persephone over and over. I admit that sitting through Norma Jean Baker of Troy may feel hellish for those seeking a traditional theatrical experience, but if you’re willing to go along for the ride, this is one trip that you may find quite worthwhile.